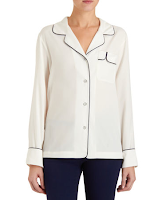 In some of the Spring 2012 fashions shows, designers like Vena Cava and Alexander Wang featured sleepwear-inspired clothing. 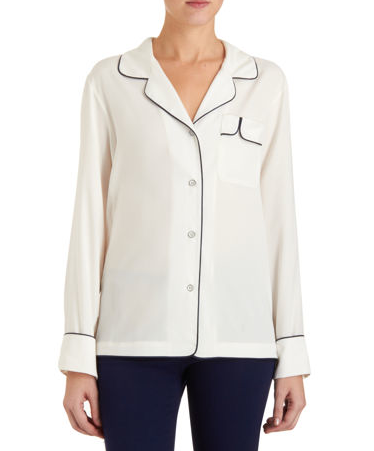 Finally, these pajama-inspired shirts are hitting the shops. Rag & Bone sells the perfect one, but you'd really have to break open the piggy bank for one of these. Silk with contrasting piping - the quintessential PJ blouse. 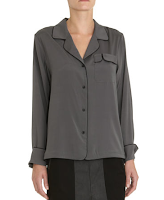 H&M also offers a cute, less-bedtime-more-downtown shirt. And finally, J. Crew's contribution - a quirky take with polka dots that feels a bit more menswear-inspired. Now you can step-up your sleepover style and hit the streets! But let’s leave the sweatpants for the pillow fights.